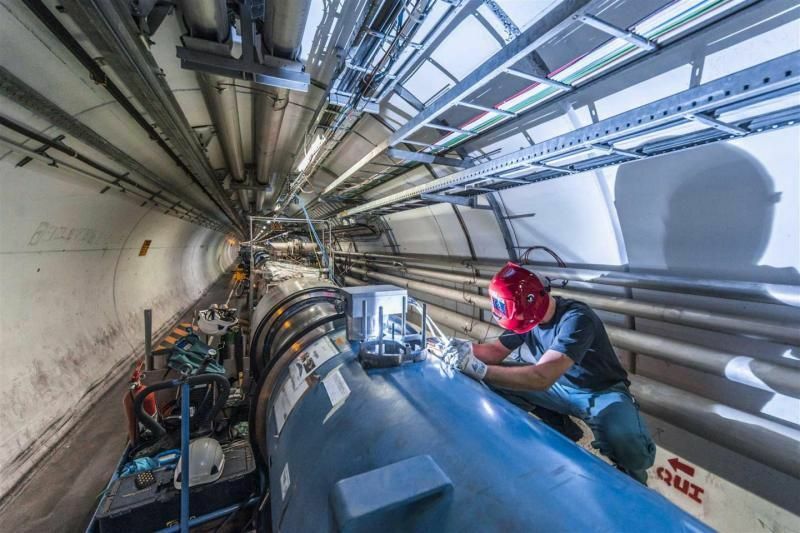 After a two-year operational pause and two months after its restart in April 2015, the Large Hadron Collider (LHC) at the CERN research center is now again recording data at energies as high as never before. These high-energy collisions at the world’s largest and most powerful particle accelerator are the beginning of a new era of particle physics and scientists hope that they will provide new insights into the structure of matter and possibly even a fundamental revision of the concepts of physics. Some 50 researchers from Mainz University will be actively participating in the research at the LHC in the coming years. For the restart, they have contributed an important component. Following its first startup at the end of 2009, the LHC subsequently gave proof of its enormous performance capabilities, culminating in the discovery of the Higgs boson in the summer of 2012. Two opposing particle beams are accelerated to nearly the speed of light and are then allowed to collide in the 27-kilometer-long tunnel of the accelerator ring, the result of which is the creation of new particles. After two years of maintenance work, the LHC was cooled down to its operating temperature of minus 271 degrees Celsius earlier this year. Since April 2015, proton beams are circling again to collide at an energy of 13 tera-electron volts (TeV), whereas only 8 TeV was previously achieved. Because of this increase in collision energy, the scientists expect to generate Higgs bosons more frequently than before. This could open a window to so-called New Physics, which extends beyond the well-known Standard Model. The greater the number of generated Higgs bosons, the more accurately they can be measured and compared with the theoretical expectations. "It would be even more interesting and important if we observe completely new particles, for example, candidates for dark matter," said Professor Volker Büscher of the Institute of Physics at Mainz University. "We have very high expectations for this increase in energy because it will allow us to hunt for much heavier particles." Thanks to technical modifications, the LHC is now able to transport more protons than before and it will produce more particle encounters at a rate of about one billion collisions per second. The experiments will generate huge amounts of data to be evaluated. Sophisticated triggers are used to capture only the really important events. 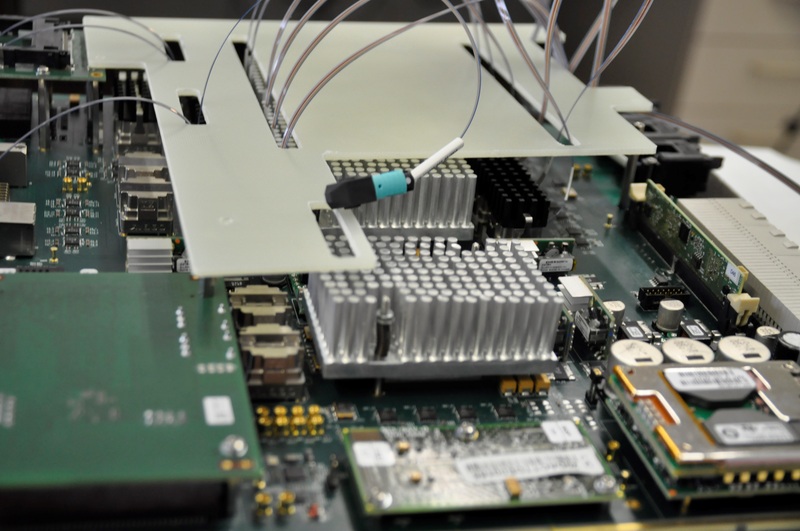 For the ATLAS experiment, the working group from Mainz has developed a new circuit board that automatically decides whether the system, rather like a camera, should record the image of a collision. "The topological trigger developed in Mainz is one of the main components that will ensure even better filtering in the future," explained Adam Kaluza, who is directly involved in this work as a doctoral candidate. 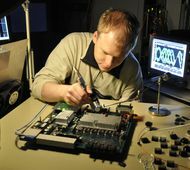 The super-fast circuit board looks at 40 million events per second and decides in real time whether each individual event should be stored or not – an enormous technical challenge. "We are now entering an exciting time that could lead us into completely unknown territory," added Büscher, referring to the new run of the LHC, which will continue until at least 2018. Mainz-based physicists are well placed with regard to the restart thanks to the Cluster of Excellence "Precision Physics, Fundamental Interactions and Structure of Matter" (PRISMA), which provides an excellent framework for taking a leading role in the new research work. Work on the dipole magnets of the Large Hadron Collider (LHC) during the operational downtime. A member of the ETAP working group at JGU, Christian Kahra, carrying out test measurements with the new circuit board for the ATLAS trigger. The module developed in Mainz filters 40 million collision events per second and automatically decides which particle encounters are recorded and which are not.